Jesus once said that we should love the Lord with our minds, as well as with our hearts. Consequently, Christianity should not be limited to a feeling; it should be applied to every part of our lives, including politics and political involvement. Since voting is a means of applying our moral and philosophical beliefs to the governing of our state and our country, Christians can love and honor God by voting for leaders who support life, family, and freedom. You too can have an influence by voting for candidates who support your values by going to the polls and casting your vote on November 6. To access Pennsylvania Family Council’s comprehensive voter guide covering U.S. Senate, U.S. House, Governor, State Senate (even-numbered districts), and State House, go to PaFamilyVoter.com. The U.S. House of Representatives and U.S. Senate together make up Congress, the legislative branch of our government, which is responsible for passing laws. Congress has the power to make laws, declare war, regulate commerce, and oversee the immigration process. Each state has two senators, whose primary role is to represent the people living in their state. The Constitution grants senators the power to write and vote on bills, to approve or reject presidential appointments to cabinet positions, federal courts, and ambassadorships, and to approve international treaties. As seen recently with Justice Kavanaugh’s appointment, the Senate is responsible both for holding hearings on and voting for any Supreme Court nominee. In the US House, the number of representatives per state is determined by the state’s population; Pennsylvania has eighteen representatives. Members of the US House have the power of impeachment over the president and the vice president, as well as the ability to introduce and vote on bills. The House is divided into various committees, where members are responsible for everything from homeland security and the federal budget to veterans’ affairs and the use of natural resources. To know who are your candidates to consider this election, go to Pennsylvania’s most comprehensive voter’s guide at PaFamilyVoter.com. We also encourage every church in Pennsylvania to take the following action: Encourage your congregation to vote on Election Day. 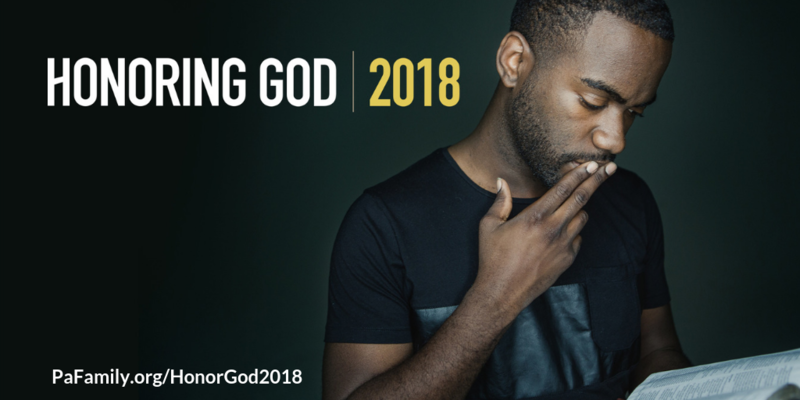 For resources to help accomplish both of these actions, visit PaFamily.org/HonorGod2018. This voter guide is a project of the Pennsylvania Family Council and made possible by donations from individuals and families across the Commonwealth. To make a financial contribution to support this voter guide effort, click here.